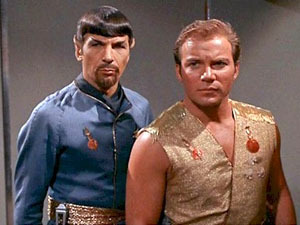 “Mirror, Mirror” is one of the all-time classic Star Trek episodes. It might feel clichéd and hackneyed now by comparison to all of its imitators, but this is really the one that started the evil mirror universe trope. And judged in those terms, it still comes up sparkling. Of course, they are in an evil mirror universe, and spend the rest of the episode trying to deal with this and figure out a way to get home without being killed by the evil Enterprise crew. It turns out that in this universe, the senior officers recruit henchmen from amongst the lesser ranks, and jostle for promotion by assassinating their superiors. Evil-Chekov tries this on Kirk, but Kirk’s henchmen protect him and Spock places Chekov in the agony booth. Evil-Sulu meanwhile flirts with Uhura, giving us a good look at his evil scar in the process. With the help of the ship’s computer, which has a male voice in the evil universe, Kirk eventually figures out that they are in a mirror universe and instructs Scotty to start working on rewiring the transporter system to send them home. McCoy, with nothing else to do, joins Scotty reluctantly. (“I’m a doctor, not an engineer!“) Uhura’s mission is to distract Sulu from his security console while the power is rerouted, so he doesn’t see the warning light. We learn that in this universe, the Federation is an evil Empire, and Kirk is ordered by Starfleet to annihilate the Halkans and take the dilithium. His reluctance to do so alerts Goatee-Spock that something is amiss, and Goatee-Spock does some detective work to figure things out. Eventually he corners McCoy and mind melds to read what’s going on. In a flash to the original universe, we see the evil Spock, McCoy, Scotty, and Uhura being dragged off to the brig. Evil-Kirk pulls some extraordinary facial expressions as he rages and offers Good-Spock “credits” in exchange for his freedom – another of the occasional references to money in Star Trek. In a subplot, Kirk finds Evil-Lieutenant Marlena Moreau in his quarters, who is his “captain’s woman”. She unwittingly acts to fill Kirk in on various aspects of this universe, including the fact that Evil-Kirk has a mysterious alien artefact secreted in his quarters that can remotely make people simply vanish from reality. It turns out Evil-Kirk has used this device to rise to Captain by simply erasing all his enemies. The question arises of why doesn’t the good Kirk have one of these gizmos in the original universe; maybe he found it but promptly handed it over to a museum. Marlena uses the device later to save Kirk from three of Scar-Sulu’s thugs in another assassination attempt. Eventually Kirk, Scotty, and Uhura gather in the transporter room, ready to beam back to their own universe, but McCoy has gone missing, and time is running out because the hole connecting the universes is closing. McCoy appears, in Goatee-Spock’s custody. Goatee-Spock, despite being coldly logical to the point of killing people, is not particularly evil as such, and has a conversation with Kirk before agreeing to beam them home and get his own Kirk back. Kirk suggests that Goatee-Spock use the alien device to off Evil-Kirk and lead a revolt against the Empire to establish a new order of peace, and Goatee-Spock says he’ll consider it. When they get home, there is some banter with Spock about how the evil versions of themselves were easily detectable because it’s hard for barbarians to act civilised, while it was easy for the civilised good guys to act like barbarians. Kirk then spots the good-Marlena, who he’d never met before as she was only a recent assignee to the ship, and goes to flirt with her over the closing credits. Whew. It’s a wild ride, and an episode that keeps you glued to the screen throughout. I remembered this one as being somewhat corny, presumably because of other interpretations of the now clichéd evil mirror universe thing, but watching it shows just how well done it was in this case. It still holds up really well, and is easily one of the more intense and compellingly dramatic episodes of the series. A definite winner! Tropes: Alternate Reality Episode, Perfect Pacifist People, Negative Space Wedgie, Teleporter Accident, Evil Costume Switch, Bare Your Midriff, Beard Of Evil, Trope Makers, Mirror Universe, I Am He As You Are He, Klingon Promotion, Agony Beam, Good Scars Evil Scars, Distaff Counterpart, I’m A Doctor, Not A Placeholder, The Empire, Exposition Beam, Evil Is Hammy, Mr Exposition, All The Myriad Ways, Evil Cannot Comprehend Good. Body count: 2 evil crewmen henchmen killed by phaser, 3 of Sulu’s evil henchmen disappeared by the Tantalus device. This entry was posted on Thursday, 6 January, 2011 at 20:34	and is filed under Star Trek. You can follow any responses to this entry through the RSS 2.0 feed. You can skip to the end and leave a response. Pinging is currently not allowed. My favorite thing about this episode is probably the way DS9 showed that Goatee-Spock doomed the Empire by listening to original-Kirk. My favorite thing about this episode is probably how good original-Uhura looked in evil-Uhura’s uniform!